I have to admit that it is so easy for me to get into a good workout routine and incredibly challenging for me to change my diet. Anyone else have that same issue? I love a good workout. I’ll run, jump, sweat, tuck, etc. and feel so accomplished when I’m done, and that high will carry me on to my next workout and the next one until that routine is well established and I feel great. That’s sort of where I am right now (and more on that in an update post next week). My diet, however, has not been quite as successful. Or at least not as consistently successful. As much as I love a workout, I also love chocolate (I have a huge sweet tooth), a good glass or two of wine and chips, salsa and guac. Because he’s a pretty good sport, Clint and I did this clean eating cleanse a few weeks ago and it actually was very easy and we’ve made some of the recipes again since. We have also tried to get into some good habits like keeping lots of fruit around for snacks, making up a big pan of roasted vegetables and grilling up several chicken breasts n Sunday night to have for the week for salads and sides. We’re off to a decent start, but we have a ways to go. Next week our goal is to have a lean, clean and green week of grocery shopping and we’ll see how we do! I love the combination of melon, prosciutto and mozzarella. I dressed a little salad of those ingredients with basil, olive oil and balsamic vinegar – delish! We love making egg cups for breakfast and this is an easy basic recipe that you can change up depending on what you like! I need to pick up a spiralizer to give zucchini noodles a try for the first time! I’ve also heard these are good with some turkey meatballs. In case you need more options for using avocado at breakfast (and who doesn’t? ), here’s 21 ways! Who doesn’t love a good brussels sprouts salad? This one sounds SO good. This Summer veggie farro salad looks fresh and light and these Maca-Cacao Truffles are the perfect snack or little sweet treat. 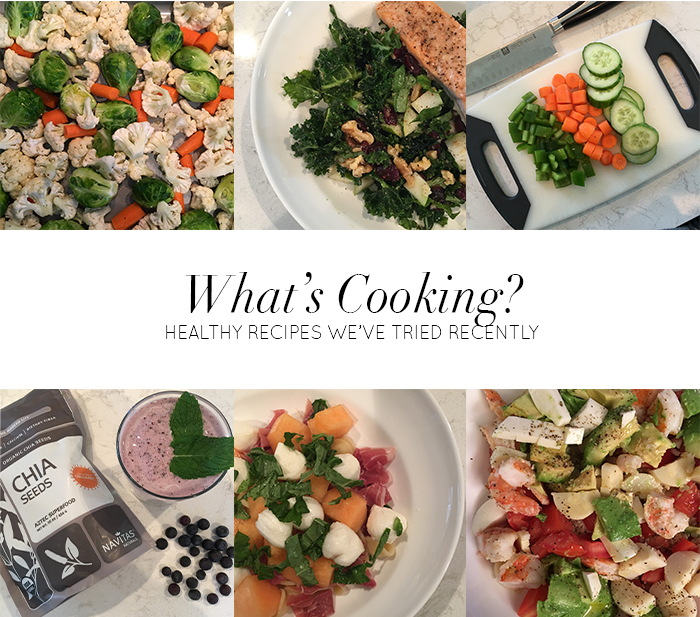 What are some of your favorite healthy recipes? Share a link or the recipe itself with me in the comments section, I’d love to hear and try them!